Our car ride down to Houston was not bad at all. Despite almost getting rammed into, we had deep conversations and caught up with our lives. Tess came back from college and Matt was moving on with his life. We talked about old friends, what we’re doing for the summer, and what blessings are set to come ahead like Matt’s marriage. The car ride did not take as long as a thought because we had so many conversations. I only slept for the last two hours of the ride! When we got to Christ Church Cathedral, we were greeted by a smile and some waves by 3 ladies: Tori, Nettie, and Christy. They were very helpful and nice and took our bags. After we got settled, we were so hungry and patiently waited and listened to the CUSE rules explained by Tori and Nettie. Each day out of the two interns, we would have either Tori, Nettie, or Fisher. Finally, dinner time. Finding dinner was harder than we thought because at first we had reservations at 8:30, but after everything it was 9:30 on a Sunday so not many restaurants were open. We finally agreed to go to Buffalo Wild Wings. It was lighting and thundering but not raining. Until we were about half a mile away from Buffalo Wild Wings, it started to rain, and we all started running. We got there safely and enjoyed a great meal, and got back home safely. Surprisingly, we walked back, but it was not raining. On Monday, Fisher and Nettie helped us with our journey. Our first mission of the day was to serve at Emergency Aid Coalition (EAC). EAC was a place where meals were served and where families can get clothes and food from the pantry. It was like an Constance Abbey on steroids. We divided into groups: the boys with Nettie and the girls with Fisher. First, the boys organized the clothes, and the girls packed some donuts. The clothes that were given were surprisingly really nice. There were about ten full suit outfits. After about an hour and a half, we switched jobs. The boys organized a lot of clothes and the girls packed a lot of donuts. The abundant fresh smell of the donuts made me want to go to Gibson’s. The girls were excited to organize clothes because organizing things is right up Libby’s alley. I don’t think the boys were as excited about packing lunches because it doesn’t sound too fun, but we worked through it. We established an assembly line: Matt and John handle the sandwiches, I handle the donuts, and Carrigan and Nettie folded the bags. As I was sacking lunches, I began to like it. It kept on growing on me and liked it so much I didn’t want to leave. I seriously didn’t want to leave. Throughout the rest of the day, I asked Matt when are we going to make sack lunches again. That was our only day, but Matt suggested helping out at St. Mary’s Cathedral and More than a Meal back in Memphis. I realized I loved it so much that I would do this as a full-time job (if it paid more). Sadly, we had to leave, so I went to go get my backpack. When I got my backpack, I overheard the conversation between Nettie and the supervisor of EAC, and the supervisor said she could use more help, but she understood we had to go. I was surprised to see how much more help she needed because we organized so much clothes and packed about 150 sandwiches. I felt sad but realized that you can never stop serving; there is always something to do. Serving is so great and can lead to lots of happiness in the world. We went back to Christ Church Cathedral, and ate lunch, the typical sandwiches and chips. Then, we went on an “Instahunt”, which is a scavenger hunt used by phones. The girls were on a team with Nettie, and the boys were on a team with Fisher. It was fun because it was a way for us to explore Houston. We explored new churches, experienced a personal tour of Rice University, and saw most of downtown Houston from the the train. The highlight of the Instahunt was when the girls went a taco shop to take a picture with the owner. The funny thing is that the owner was not there and that they had to walk about a mile or more to the taco shop. While they did that, we, the boys, went to Rice University to continue our scavenger hunt and gain points. We went back to the church and ate pizza. After the delicious pizza, we went to go work with Friends of Northside, an organization that is a branch of Attack Poverty. They work to empower people who have fallen on hard times and provide support for those in need. The house we were working on had been burned down. It was very sad when the woman told us her story because she thought it was going to be the best year of her life for her family, but everything seemed to be falling apart. She is still optimistic and believes this year will be the best of her life. It was us and another group of ten people who helped us, and it showed that there are many good people making this world become better. After more than two hours of hard work, the dumpster was 85% full. Although we were tired, we learned from it. Personally, I wanted to work more. We had to go back and took showers. The long cold showers were nice, and Matt treated us with some ice cream. After having a conversation about ramen, Matt bought three packets of ramen: beef, chicken, and shrimp. We had a little mini ramen bar and also were excited about the leftover pizza from dinner. Sadly, the kitchen was locked, so we couldn’t get the pizza, so Matt bought us more pizza. It was very kind of him, and then we finally fell asleep. At the end of the day, we saw how serving can impact so many people, but we also realized how serving can impact us. We learned from it, and Matt told us a quote that was stated by Father Gregory Boyle, S. J. who spoke at Holy Communion. It was like we shouldn’t change the homeless people to become us but change us and them to become one whole group. Personally, this trip so far has brought me closer to my youth group because I was not always social with them. I was always friends with the older people. I am glad this has impacted me, and I know this will motivate me to come to youth group more. On Tuesday, we had to go back and work with the Friends of Northside to finish up our work. Fisher and Tori worked with us. We were the only group there. We got a lot of work done, but we all knew that we could have gotten a lot more done with a new dumpster. The dumpster was full in 20 minutes. Despite this, we kept on working and just put everything to the side to make it easier for the next group. The highlight of this was that everyone was working and working together. Also, Matt showed his dad-like traits by sawing down some tough wood and dragging and picking up heavy things. He could be ready to be a dad already! We got the front walls and roof down, and all there was was the scraps and the back. 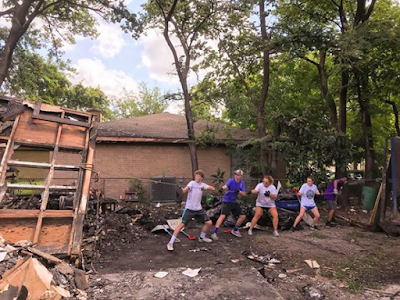 We had to go back to the church for lunch, and sadly we aren’t going back because we have to serve others and explore other areas of Houston. On June 5, 2016 we started out the day going to St. Andrew’s Cathedral. There we shared the body and blood with people from all over the world. Shortly after the service, we went to their after-church reception and mingled with the congregation, many of whom were Nigerian. All of them were very welcoming and very open about their faith and participation at St. Andrew’s. Afterwards, we did lectio in the church and read 1 Corinthians 10:14-17. We discussed how cool it is that 80 million people all over the world are partaking in the same worship. We come together as one even though we are many. Next we went to lunch and just about all of us collectively ate entire pizzas. After lunch we were split up into two groups. 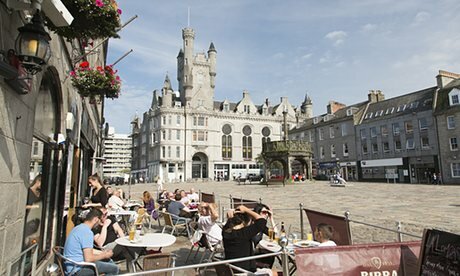 One stayed in Aberdeen to shop and the other went to play soccer and golf. The shoppers ended up going to a mall. Many of the girls bought clothes and perfume while the boys stapled 30% sale tags to themselves. The second group went golfing first. Call and Phillip both scored a par on one hole, while Stuart took at least five minutes to make contact with the golf ball. Once she did, it took a nice roll of about five feet. The second group then went on to play soccer. Afterwards, we all partook in the 6:30 Evensong service at St. Andrew’s. Evensong is a prayer service where the priest and the choir sing together in harmony. All of the pilgrims were a bit restless until the choir sang the anthem. It was so beautiful and brought the listener peace and calmness. Shortly after we walked to dinner and dined on delicious Peri-Peri chicken. We then went back to our hotel and grabbed our BCP’s and journals. Like every night we ended in compline and sharing our junk, joy, and Jesus. It’s really cool to see how much closer the group is now compared to when we landed in Edinburgh on Monday. Everyone is much more comfortable with being open about their faith and sharing their opinions. Like the body and blood, this group has come together as one. 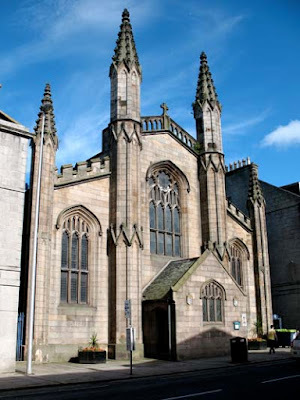 On June 4th, we traveled from Burwick-upon-Tweed, England to Dundee, Scotland. We saw the R.S.S. Discovery in Dundee. It was a ship that went to explore the South Pole but was trapped in ice for two years. On the boat, we reenacted the Titanic. While waiting to eat lunch, we played Ninja and Down by the Valley. For lunch we had the option of getting Mac and Cheese and chips, a burger that had jam on it, or a BLT. Also, some people bought a cream and jam scone and it was excellent, as were the gluten free brownies. On the bus ride, Allison and I asked Matthew questions we had about our faith and others joined in to listen and participate. One question we had was if Hitler asked God for forgiveness and was sorry, would he go to Heaven? Matthew gave us two stories, one biblical, and the other real life, and asked us what we thought about those case scenarios. It was cool to realize that God is more all forgiving but in order to be forgiven, we have to accept God’s forgiveness, which can be challenging when you killed 8 million people. We also asked about life after death and if you could grow closer to God. We talked about how Heaven was more of a state of being rather than a physical place and that the concept of God is hard for us as humans to comprehend. This bus ride took us to our hike along the coast that turned out to be very off route. Matthew had to scamper ahead to find paths for us and he even built us a bridge to cross over a stream/fence. We climbed steep hills, were attacked by nettle, hopped through barbed wire, and trespassed on private property where sheep roam. Everything’s fine! We got so off road, we had to call the bus to come and pick us up. Although that was not planned, it was still a beautiful hike and we don’t regret anything, accept for the nettle. We split up and did Lectio in our small groups and the lesson was Job 38: 1-15. Job was questioning God and God was answering him in question. Ross told us G.K. Chesterton, an old English author, said “The riddles of God are more satisfying than the answers of man.” We learned that it’s good to ask questions, but also if we don’t find the answers to our questions it’s ok. For dinner, we went to a really good Chinese restaurant and Ross had preordered different dishes for us. There was a lazy Susan on the table and Bennett immediately spilled his water on it. We all had a fun time spinning it as fast as we could. After that, we had Compline and shared our junk, joy, and Jesus moments of the day. Allison and I’s Jesus was talking to Matthew and co. on the bus, Stuart’s joy was the hike and the delicious scone, Allison’s joy was the beautiful views, and we both had no junk! We got our roommates and stayed in Aberdeen for 2 nights. Today started pretty slow because everyone was tired from the night before. By now, everyone is close to one another, even if they didn’t know that many people before the trip. This has already led to people staying up until 4:30 having late night/early morning conversations (Not approved or recommended by any of the adult chaperones). However, conversation was limited from lack of sleep as we ate our mediocre hotel breakfast in McDonalds (Because you stayed up until 4:30 instead of sleeping, which was actually what we told you to do. Mediocre? It was a healthy balanced meal consisting of cereal, a nutra-grain bar, a muffin, and orange juice; plus whatever else you wanted to get from McDonald’s….Sounds pretty solid to me…). We finished our breakfast, gathered our things, and boarded the bus for the day. We were going to the Holy Island of Lindisfarne. 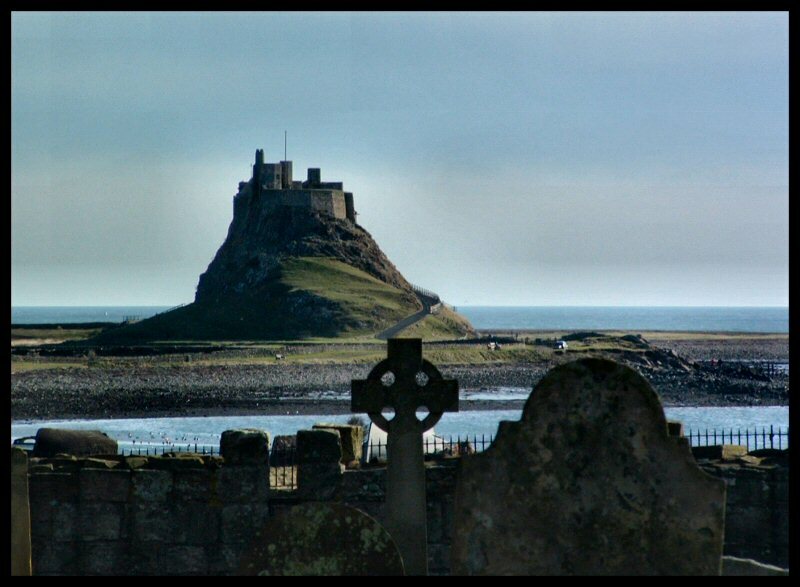 Lindisfarne is an Island off the coast of England where St. Cuthbert started his monastery and then eventually died. Now it is a holy ground for pilgrims to venture to gain a greater relationship with God. Lindisfarne is believed to be a thin place—a place where the barrier between you and God is thin. As we came into the island and into St. Mary’s Church on holy ground, we came to this thin place. Hester led us through a service in the church (We celebrated the Eucharist in the same place that St. Cuthbert and St. Aidan would have done so many years ago.) , which was built on the same ground that the church St. Cuthbert built was on. After the service, we split up into our small groups and explored parts of the island. My small group explored the ruins of the priory of St. Cuthbert and his followers. Then we climbed to one of the high points of the island and looked out onto the whole island and back to the mainland. After that we climbed down to go to lunch in a small café. After lunch, we did Lectio Divina with our small groups and then came together to build a cairn. A cairn is a pile of rocks that marks where pilgrims have been. Then we divided up and one group went back to sit and talk in a café, another group, only consisting of David went to check out the castle (which was actually closed), and the other went on a hike around the island. I went on the hike and had a nice conversation with Wesley and Charlie. We finished our hike and then got on the bus and left Lindisfarne. We ate dinner at a pizza place and then went to McDonald’s to do Compline. After Compline, we went back to our rooms where I had a short wrestling match with Andrew (Again, not recommended or approved by any chaperones) and then went to bed.